VR isn’t just for recreation right now, it is becoming massively popular thanks to sense of being immersed in time and space. No matter where you are, you can enter different world just by putting on headset. Over the last year we’ve witnessed explosion of content for VR, luckily not only new games were created. The genre is expanding to include also social VR, which is basically‘connecting two or more real people in a virtual world’, as explained by Facebook on it’s F8 developer conference. Why social VR will be huge in digital entertainment? Immersive 3D environments offer much more than just more realistic video gaming. Thanks to it’s nature, VR provide experience across all mediums. It’s a matter of time when leading content providers like Facebook, Oculus will decide to put more effort into this technology. Once they decide they want to fulfill our need for social interactions, huge amount on people will realise that this thechnology is the future. We firmly believe that in near future users will be able and, more importantly, want to interact with their friends and family in VR. They will be able to re-visit every memory, e.g. sister’s wedding, Eurotrip 2017 with Mike and Julie, etc., you name it. All that with a real feeling of presence, as if user is really there on the scene.Co-experience is the next huge thing. That’s why we’ve decided to create quick summary of social VR content available right now or in near future. Although Facebook didn’t release anything publicly yet, it has two teams working on social VR. On F8 developer conference two of their employees in separate locations put on Facebook’s Oculus Rift headsets and met in London. Their digital avatars were able to chat and experienced London. They even took a selfie and shared it directly to Facebook page. One of challenges is to make avatars more real, right now they look like cartoons, not much like real person. One of possible solutions might bescanning your face and body with mobile device. On Oculus Connect conference in October, company showed avatars with realistic eyes that blink and lips that try to imitate motion of talking. Our avatars can display emotions and expressions like ‘smiling,’ ‘confused,’ ‘skeptical,’ or ‘listening’. Social media platform also unveiled ‘Oculus Rooms’ — virtual spaces where up to eight people can meet, watch TV, listen to music or play games together. Available for HTC Vive, Samsung Gear VR and Oculus Rift AltSpace VR is probably closest to what idea behind social VR is all about now. Real people can meet in virtual world and communicate, play games together and participate in various events. After choosing avatar you can explore various spaces, host your own event or choose to go to events created, with even hundreds of users around you from all over the world e.g. session of D&D or Election Night. You can also watch YouTube and play Twitch stream. AltSpace’s strength lies in very easy communication, however, some concerns were raised recently due to drop of active users. It is still unclear what will be the future of this social VR app. You can read more about ithere. This spiritual successor to Second Life is open sourced and supports HTC Vive, Oculus Rift, Hydra PrioVR and Leap Motion. You can jump in with friends, chat and interact with virtual spaces. What seems to be really promising is sensor-based capture of gaze, facial expressions and body language. Also, if you can code it, you can build practically anything into High Fidelity’s worlds. Right now around 70 of them are available. Developed by LindenLabs, creators of aforementioned Second Life, Sansar will be new platform for creating VR experiences. It will empower people to create, share and monetize their own multi-user, interactive virtual experiences, without requiring engineering resources. Users will be able to explore and socialize through expressive avatars, using text and voice chat. Date of release was moved to early 2017, but it is available for creators by invitation. You can apply here. VRChat is available on Oculus Rift and HTC Vive. It’s Unity SDK allows users to create new virtual worlds. They can also play and create with people from all around the world. Moreover, you can customize your private space. Avatars can be customized as well or chosen from those created by other users. Released for Samsung Gear VR, Oculus Rift and Google Cardboard this freeapp allows to interact with family and friends in still growing library of virtual environments. It allows customization of avatar and chatting inside your 360 photo gallery. Idea behind cluster. is to offer meet ups for creators who don’t want to leave their home. They can participate in various events just by using their headsets. Meetings vary from small and private to huge ones with thousand of participants. This app created in Japan is right now available on Oculus Rift. Even if more than 1,000 connections are established simultaneously, users are unlikely to feel a heavy load on the system. Still in alpha phase, this social media platform encourages you to view and share 360 photos with global VR community. It’s goal is to make spherical panoramas as accessible as YouTube. Described as one of the best games that captures Wii Sports social experience Rec Room is available on HTC Vive for free. It’s very intuitive so reading manual is unecessary. There are simple custom avatars and variety of sports that you can play with other users. Created by small studio Against Gravity, this game has one feature that is unique in VR — paintball. It became massively popular mainly because it’s the mixture of new and old. Shooting and dodging in room-scale is a thrill. While the game remains free, creators are admitting it might move to freemium model where add-on will be available for sale. Available on HTC Vive and Oculus Bigscreen is still in Beta phase. It lets you use your computer in Virtual Reality. It works with all of Windows application. It has also Multiplayer features that let you spend time in virtual rooms with up to 4 people. There you can wach movies, chat, play games and see their computer screens. Dozen virtual environments are there to choose from. This browser editor is available on HTC Vive and Oculus Rift. Experience differs from other metaverse applications due to its ability to receive content from any remote server. Webpages become 3D spaces where people can collaborate and build together. Perhaps most chilled VR hangout along with Rec Room available on HTC Vive. Shoot pool, play darts or airhockey with your friends and gain experience to unlock headsets to wear online. Or just throw things in the bar without worrying about consequences while chatting with your mates. Created by Doghead Simulations rumii is available on HTC Vive and Oculus, mobile devices and desktops. It is more business tool but definitely has social aspect into it. 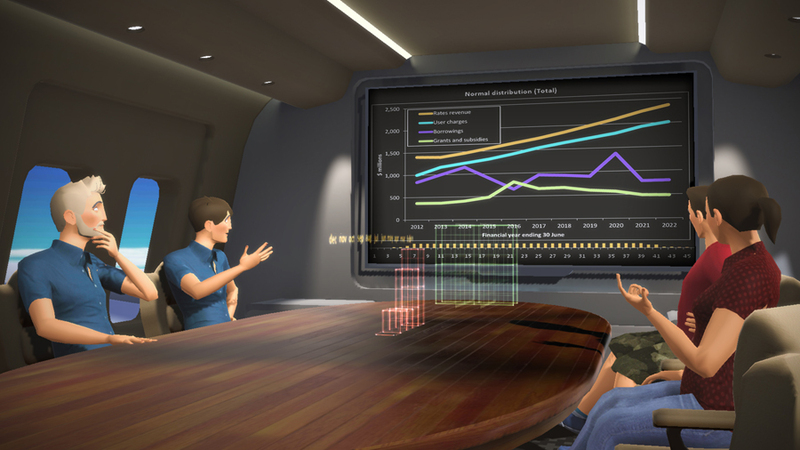 It allows teams distributed all over the world collaborate and communicate in virtual rooms. They can share presentations and manipulate objects for 3D product design and innovation. Created for HTC Vive, Anyland is open virtual reality universe. You can create your home, chat with other users and explore the world. With the rapid growth of VR technology that we witness right now, VR content is blooming too. Although there are some places where it’s possible to socialize, there still are huge uncharted areas. It’s a matter of time when headsets will be more affordable and when it happens, users will want to hangout with friends, meet new people or cowork even more. It’s fascinating where this technology will lead us.